Every morning – open to children from Nursery through to Yr6. Year 5 Cookery Club ended with yummy Rhubarb Crumble! We picked the rhubarb from the school garden and made the crumble with flour, margarine and sugar. Everyone agreed it was delicious! Thank you to the Gardening club for providing us with the rhubarb! Year 3 / 4 science club finishes with a bang! Some of the children from Year 1 and 2 have been enjoying football club with Mrs Taylor and Miss McMahon on a Monday after school. 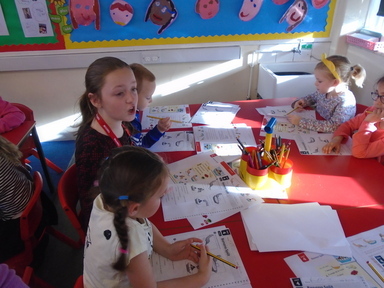 Some of the children from year 3 a nd 4 have been continuing to enjoy science club. This week we made cinder toffee. It was delicious. Due to the success of our last set of after school science club sessions, Mrs Commons will be running another set of 5. Children will be making bath bombs and soap, as well as cinder toffee and sherbet. Hope you all have fun. Mondays from 3:15 - 4:15. Running till the Summer holidays. Run by Mrs Rudge. We have fun learning lots of songs ready for a performance for the rest of school in July. Mondays, from 3:20 to 4:15. Running till July. Run by Mrs Overman. We play lots of games on our bikes to develop confidence and cycling skills. We also learn bike maintenance and safety.